Radiographs, or x-rays, are one of the most important diagnostic tools in veterinary medicine. X-rays are useful for examining your pet's bones, lungs, heart, abdomen, oral cavity and other areas of the body. They are also extremely helpful for diagnosing and monitoring many medical and surgical conditions. An x-ray can detect a fractured bone, tumor, or heart problem and can locate an obstruction or foreign body in your pet's stomach or intestine. Because we believe that pets throughout Albany's Capital District area deserve the best possible care, we have invested in a state-of-the-art, high-quality digital veterinary x-ray machine. With digital radiographs, the veterinarians at The Village Animal Clinic are able to diagnose a very wide range of medical conditions with more speed and accuracy than compared to x-rays taken with a standard x-ray machine. We can quickly take highly detailed x-rays, manipulate them to gain a better view of your pet's bones and internal organs, and then display them on a computer for you to see. Ultrasound is a pain-free, totally non-invasive technique that uses high-frequency sound waves to produce a real-time image of your pet's internal organs. Often used in conjunction with radiographs (x-rays), ultrasound provides a movie of what is happening inside your pet's body. Additionally, unlike x-rays, diagnostic ultrasound does not use ionizing radiation and there is no known health risk associated with its use. Ultrasound is particularly useful in viewing your pet's abdominal organs and evaluating heart functions. 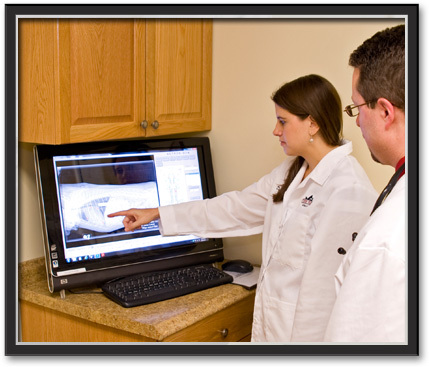 Abdominal ultrasound allows us to fully examine your pet's liver, gallbladder, spleen, adrenal glands, pancreas, kidneys, urinary bladder, and parts of the stomach and intestines. Ultrasound also works well in conjunction with other diagnostic tools and a wide range of diagnostic procedures. For example, a radiograph of your pet's abdomen may show enlargement of the liver but does not tell us why it is enlarged. An ultrasound allows us to see the liver's structure in greater detail and identify specific lesions or masses. Using the ultrasound image as a guide, The Village Animal Clinic veterinarians can obtain biopsies without major surgery and your pet can often go home the same day. Ultrasounds are typically not stressful for your pet and take anywhere from 30 to 60 minutes to perform. Performing preventive medicine as well as diagnosing emergent internal health issues requires the ability to perform a wide range of laboratory tests on blood, urine, feces, and biopsied tissue. Without timely access to precise laboratory test results - blood testing, biopsies, microscopic examinations, bacterial culture sensitivity, and more - it is difficult to make an accurate diagnosis or assessment of your pet's health. 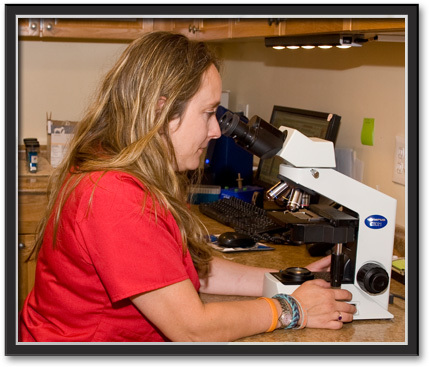 Laboratory testing allows our veterinarians to obtain additional information to assess your pet's overall systemic health without the need for invasive and expensive procedures. This is why we maintain an advanced in-house laboratory and regularly perform tests during your pet's wellness exams or when we suspect your pet may have a health issue. For example, diagnostic testing can detect heartworm disease, lyme disease, infections, feline leukemia, intestinal parasites, urinary tract infections, and many additional diseases and conditions that can go unnoticed in their early stages. Early blood testing can show evidence of disease such as diabetes, changes in liver or kidney function, or simply provide a baseline for future reference. Diagnostic testing is also included in pre-anesthetic screenings prior to dental or surgical procedures that require general anesthesia. Annual wellness blood and urine tests, along with other diagnostics, assist us in the early detection of diseases and health conditions.